AMUT GROUP, headquartered in Novara, Italy, is a global leader in plastics extrusion field, since 1958. Starting with the production of different kind of extruders, the company has continued its technological improvement up to manufacturing complete lines. AMUT stands for innovative process engineering as well as flexibility and high quality production. Extruders and dies are still own design and production. AMUT GROUP has premises in North America and in Brasil (AMUT WORTEX) and two special divisions: AMUT COMI, dedicated to the thermoforming industry and AMUT ECOTECH, producer of waste sorting and disposal equipments. 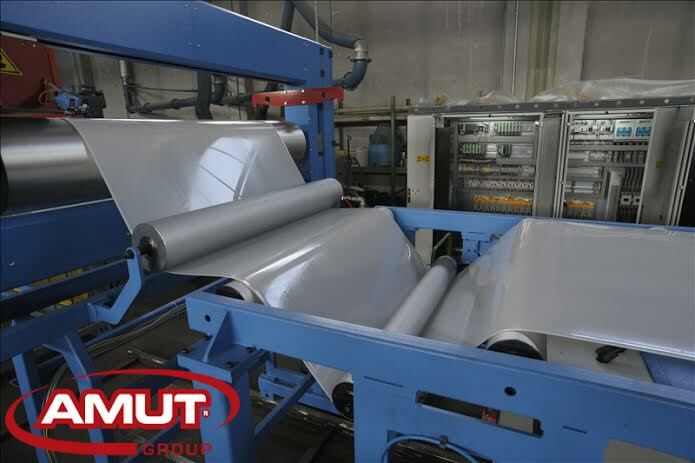 AMUT production range is wide and suitable for a large number of different applications: plastic extrusion lines for foils, sheets and multicellular panels, with nominal width from 400 to 3300 mm, thickness from 150 microns to some centimeters, configuration up to 9 layers and output over 4000 kg/h. Thermoplastic materials used are PET, PS, PE, PP, EVA, EVOH, PVC, TPO, HDPE, F/PVC, ABS, PMMA, PC. 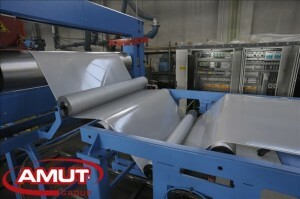 AMUT overcomes the mass production limits providing lines for the production of profile and panels made by single and multilayer sheets, with thickness range from 0,3 to 3 mm and width from 350 to 700 mm.Depending on the material and on the Customer’s requirements, the extrusion section can be equipped with single-screw, counter-rotating twin-screw or co-rotating co-rotating screw extruders. The embossing process can be done directly in the calender, by means of a purposely embossed roll fitted with extra quick-change supports, or in a post-calender embossing station. This second option enables a quicker change of the embossing rolls permitting frequently changes of the finishing surface (these operations can be carried out also while the line is in production). The lines can be set up with unwinding systems suitable for warm lamination of sheets or textiles in the calendar, whilst the end-of-line is characterized by a winding system equipped with cantilever shafts. AMUT is also dedicated to providing solutions to produce WPC, with the special range EasyWood, which covers lines with output from 250 up to 600 kg/h. WPC is obtained melting polymers (PE, PP, PVC) with up to 80% natural fibers (such as wood flours coming from rice husk, sugar cane, hemp,…) and some additives. The finished product has a wood like appearance and its main applications are in construction, building exteriors and interiors field (decking, fencing, skirting, panels, wall and ceiling claddings, door applications). Compared to wood, WPC needs a low maintenance, has a good ageing and heat resistance, weather resistant, fungi free and flame retardant. The WPC market demand is growing worldwide, especially in that countries where the government wants to adopt an Environment Friendly attitude: in fact the WPC polymeric mixture can consist of material coming from industrial scraps or post-consumer waste. Moreover, the extruded products are 100% recyclable. AMUT EasyWood lines, with direct extrusion or compounding, are equipped with gravimetric dosing system for materials and are based on plasticizing, mixing and extrusion with counter-rotating twin screw extruder as main unit. AMUT offers solutions as well as for the healthcare field: extrusion lines producing nontoxic PVC foil to medical sacks (thickness from 200 to 500 micron) and equipment for medical tubing. Both types satisfy medical industry requirements: dimensional precision, reduced tolerance in production, clear or mat surface and absolutely no contamination allowed. AMUT is involved in line concepts to extrude pipes: PVC pipe lines with diameter of 16-1200 mm for rigid pipes and 8-63 mm for the flexible, PE pipe lines (monolayer) with diameter of 16-1600 mm and special pipes multilayer such as PE-X, PA (fuel pipe), PP (hot water, internal glass fiber), flexible PVC reinforced hoses, irrigation, foam core, corrugated, bi-oriented and automotive pipes.